So, spaghetti squash, I just love it. It is so versatile. Since they are now in season, I have been finding them on sale for $0.99 at Aldi. I basically pick one up any time I go in there and see them for that price. They make great dinners. Have you tried this recipe yet? I have also found that they make great lunches for work! Now I would have never considered it unless they were leftovers till recently. Why? Because I don’t want to spend the time to bake the squash for my lunch. Problem solved! I recently came upon a new way to cook my squash that is so much faster and most definitely makes me want to include more of it into my diet this fall. Say hello to your new spaghetti squash friend, the microwave! It’s the exact same as cooking a potato in the microwave. Pierce it all over with a sharp knife or fork then pop it in the microwave for 5 minute intervals. Rotate it every 5 minutes. I have never had to cook mine more than 10-15 minutes, but this all depends on the size. Then just let it cool long enough that it isn’t too hot to handle, cut it in half lengthwise, scoop out the seed-y gooey center, rake through the squash with a fork. Ta-dah! You’re done! You can serve it right from the squash or in a dish. Today’s recipe goes in a dish, but could definitely be constructed bake in the squash if you wanted. If I make it for lunch I scoop each half into two different Tupperware containers. So one squash makes two lunches for me. Meal prep! Today’s recipe is: Spaghetti Squash Lasagna. 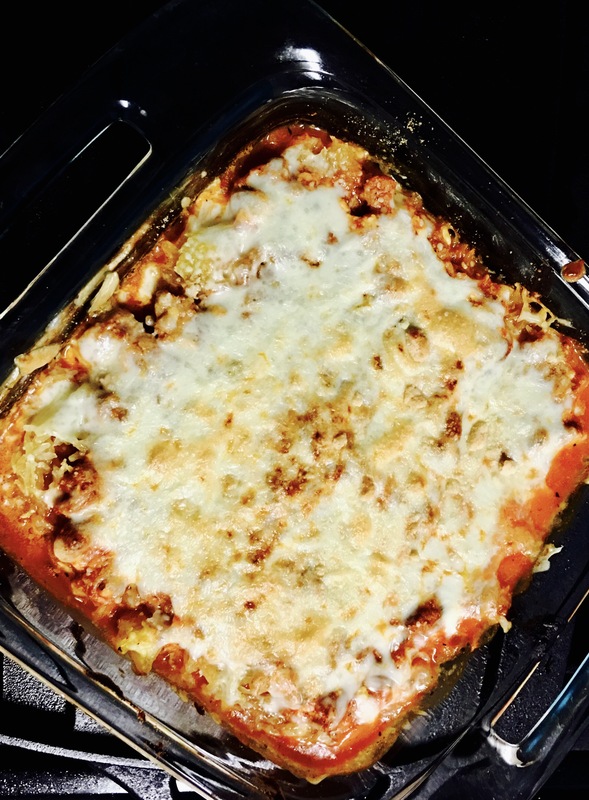 All the tasty lasagna goodness with less calories, carbs, and effort to make. Now, you can take this simple recipe and run with it however you would like. There really are so many ways you can change this to fit your personal needs and wants. Health reasons why I love this recipe: you get a nice big vegetable serving out of this, you get more fiber and less carbs, this means lower calorie, the portion is big (remember, it’s lower in carbs and calories and you can eat a bunch of veggies for very little calories? ), low fat cottage cheese adds a good dose of protein and cheesy-ness, tomato sauce adds more veggie power. Okay, I’ll stop, but you get it, right? Tastes delicious, fills you up, easy, low calorie. I’m hoping to get some Fall-ish meals out to you all very soon! What are some ways you like to prepare spaghetti squash? Set oven to broil HI. Pierce squash with knife all over and microwave for 5 minute intervals till soft. Turn squash between intervals. CAUTION WILL BE VERY HOT. While squash is cooking, cook sausage in skillet. Add pepper onions and mushrooms once meat is almost done cooking if using. Turn heat to low and add 14 oz can tomato sauce and 1 cup cottage cheese. Stir occasionally till warmed. Add seasonings above to taste. Cut squash in half, scrap out the seeds and gooey center. Use a fork to rake through squash and scrape it into a bowl. Season with salt and pepper if desired. In an 8×8 glass baking dish, scoop 1/3 meat mixture into the bottom of the dish. Place half the squash on top of that. Add another third of the meat mixture and half of the cheese. Add the last half of the squash, top with the rest of the meat, cheese, and grated Parmesan. Broil till cheese is melted and browned. NOTES- the squash is quite liquid-y. If this bothers you, I would recommend putting it in a strainer with paper towel for a few minutes before layering. Depending on the size of your squash, you may not need to use all of it. You can swap any meat you want. Turkey is a lean option. You can swap ricotta for the cottage cheese, but cottage cheese gives this dish more protein and less calories. Quick prep- take squash for lunch by putting you pre cooked squash noodles in a Tupperware and top with sauce, cottage cheese, and shredded cheese. Microwave to warm and stir till combined. Add frozen pre cooked meatballs if desired.